The non-traded REIT, American Realty Capital New York Recovery REIT, Inc., renamed New York REIT, became a listed REIT this week. It opened at $10.70 and closed at $10.75 on April 15, 2014. Yesterday, April 16, 2014, it closed at $10.55 and today it closed at $10.62. We’ve posted extensively about the evils of non-traded REITs. You can find those previous posts here. The April 16, 2014 Wall Street Journal’s “New York REIT Starts Fast” quotes Nicholas Schorsch as saying the first day’s close of $10.75 was a “victory” and reflected the “most successful” of his listings. You would think from his comments that investors in the non-traded REIT had done well but that is not the case. Based on NYRT’s $10.62 closing price, the value of the $1.5 billion invested while NYRT was non-traded is $1.82 billion. We estimate that retail investors in this REIT have experienced returns greater than what they would have earned in Vanguard’s liquid, diversified mutual fund of traded REITs (VGSIX), they are about about $100 million less than what they would have earned investing in the traded REIT which also focuses its investments in New York, SLG, over the same period. Figure 1 shows our estimate of the value of retail investors’ investments in American Realty Capital New York Recovery REIT had they instead been made in SLG. The three red dots are the values of those investments at NYRT’s closing price for its first three days of trading. Investors who suffered through years of illiquidity and lack of transparent pricing with the non-traded REIT ended up doing much worse than they would have if they had purchased a traded REIT with the same New York real estate concentration. 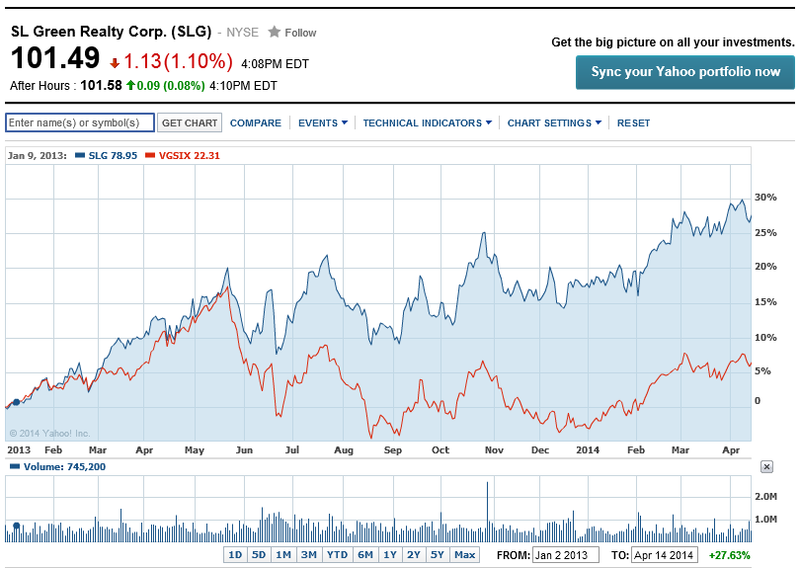 We think the relative performance of NYRT relative to SLG is going to get worse. Most of NYRT’s capital was raised and properties purchased were in 2013. Since then New York real estate prices have increased 8% according to a source quoted in the WSJ article. Given the 11.5% upfront fees (nearly $200 million) on this non-traded REIT, NYRT should still be worth less than $10. So, how does a high-cost, defective investment like American Realty Capital New York Recovery REIT, Inc. become listed to some fanfare? 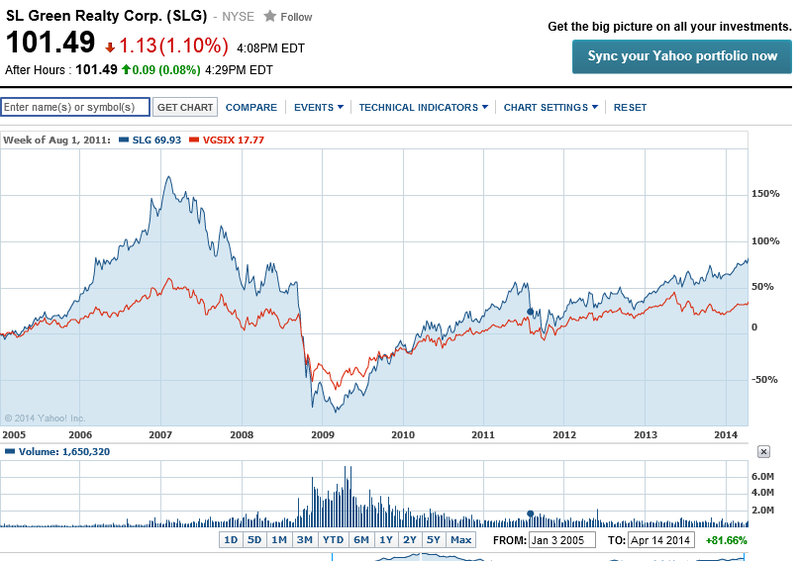 Figure 2 is a screenshot of SLG and VGSIX during the period NYRT was raising most of its money. During this period, New York real estate values were increasing more rapidly the diversified real estate holdings. Rising New York property values allowed this non-traded REIT to invest $8.80 or less per $10 investors paid into real estate and have that $8.80 plausibly grow to $10 within a year. Of course, investors would be much better off if all of their $10 investment had been invested in this real estate. The increase in New York real estate relative to diversified portfolios of real estate in recent years illustrated in Figure 2 is only the sunny side of the lack of diversification. Extending the time period back a little we see the enormous decline in the value of an undiversified investment in New York real estate in 2008 and early 2009. This week’s NYRT listing must be welcome relief for investors who were trapped in the previous, non-traded incarnation. Unfortunately, it may well lead to even more sales of non-traded REITs in the future. In the near future, we will be posting the results of our extensive investigation which shows the non-traded REIT industry has destroyed at least $25 billion of investor wealth over the past 10 years.